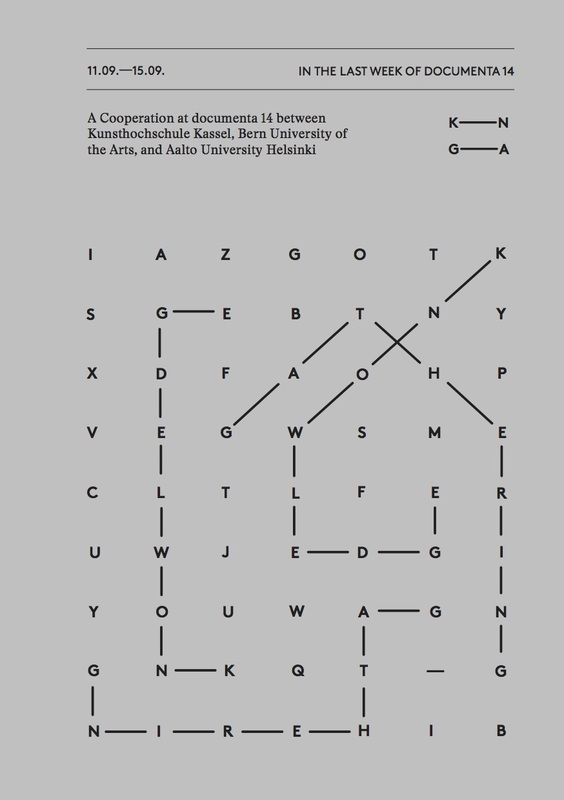 A Cooperation between School of Arts and Design Kassel, Bern University of the Arts, and Aalto University Helsinki in the last week of documenta 14, September 2017. (more) With its working subtitle „Learning from Athens“ documenta 14 takes its starting point on unsafe grounds: it invites for a dislocation and a process of unlearning. 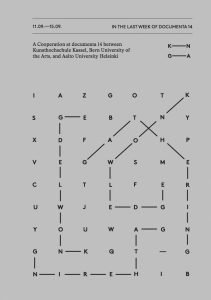 Unlike documenta 12 which focused on questions of content or documenta 13 that explored specific discourses and dominant narratives, Documenta 14 concentrates on multiple voices in knowledge and knowledge forms. This presents the public and art educators with a tremendously vast range of topics, relationships, discourses and narratives set up in a manner that dissolves boundaries rather than contains and structures them in the exhibitions in Kassel and Athens, the two cities where Documenta 14 takes place. Which topics, relationships, discourses and narratives resonate within the group? What does unlearning mean? And how can we understand curating under such post-representational conditions? What is a curatorial gesture? How can a big exhibition project take a stance? Where is documenta 14 situating itself between local social and political struggles and disagreeing universalities? And where does it stand in relation to the conflicts within which it is happening? How does the educational program at Documenta 14 work? How can a finding be formulated while still keeping with the multiplicity of voices? What is important to us? How can a lack of knowledge (or an overwhelming presence of different knowledges) be dealt with in a productive manner? Given the fact that there is not anymore only one existing canon, can art educators simply tell any story they like? What can serve as a point of orientation and how can the tools with which we approach this be calibrated? In what ways are this maximum production of knowledge and lack of knowledge documented? What impact will this have on future exhibition projects and debates in art education? Discussions and talks with invited (temporarily) local actors, an exhibition, and an evening program are the formats for the exchanges that will take place in various forms and on various different levels. This collaboration will produce and present compilations and congregations of experiences (knowledge gathering) and collectively devised questions and possible approaches or responses (gathering knowledge). Directed in collaboration by Gila Kolb, Research Lecturer at the Bern University of the Arts and member of the „faculty“ of documenta 14 aneducation, Prof. Dr. Nora Sternfeld, Professor for Curating and Mediating Art at the Aalto University in Helsinki and designated documenta-Professor at the School of Arts and Design Kassel. *The term Knowledge Gathering is a quotation by the aneducation program of documenta 14.”Aneducation develops an artist-led, process-based approach through research, personal exchange, listening, conversing, walking, reading, and looking—gathering knowledge but also dispersing it like a breathing organism.